We started a non-profit for puppet arts – Lilypad Puppet Theatre! 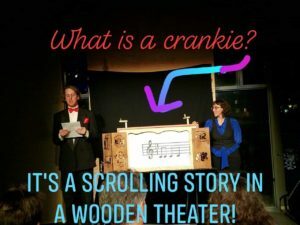 One of the shows we produce every year is the Crankie Cabaret! This is a variety show of crankies, with live music and absurd theatrics. The 3rd Annual Crankie Cabaret will take place on November 7 – 10 2019 @ The Cherry Artspace. Join our mailing list for Crankie updates! Here are some examples that we love from other artists that inspire us!